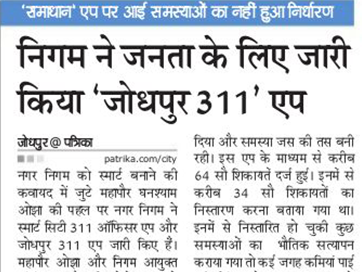 We are feeling privileged to share this news that we have launched the Jodhpur-311 application on 21st January 2015 and our developed application covered by a leading newspaper of Jodhpur. We got featured on Jodhpur Patrika of 22nd January 2015 edition. Now, the application enables citizens of the city and Nagar Nigam officers to make the city of Jodhpur smarter. Citizens can report non-emergency issues to Nagar Nigam officers while officers can submit real-time inspection reports, mark their attendance online and track projects of the city.